Do you ever feel like you are spinning your wheels and going nowhere? ….but you just don’t seem to be advancing much towards them. This can be so frustrating, especially when you know your goals are worthy ones. It can make you feel like there’s no use even trying or like there’s something wrong with you. But I want to encourage you that God does give us dreams and desires for our lives for a reason. Many of the dreams in your heart may actually be from Him. The specifics may not be exactly the way they look in your head, but God does want us to grow in different areas of our lives, have good relationships, enjoy life, and feel fulfilled in life. But why is it so hard to make changes and grow? Why is it so hard to reach our goals? Well, it’s often not our goals that are the problem, but the process of how we try to accomplish them. One of the reasons some experts suggest setting goals rather than resolutions, is because simply “resolving” to achieve your resolutions is not enough. Will-power just won’t take us through to success, because far to often we won’t “feel motivated” anymore, and the resolution will drop off to the side, forgotten. Goals, on the other hand– if made “SMARTly” (see below) and with the right systems in place– are much more likely to cross the finish line. 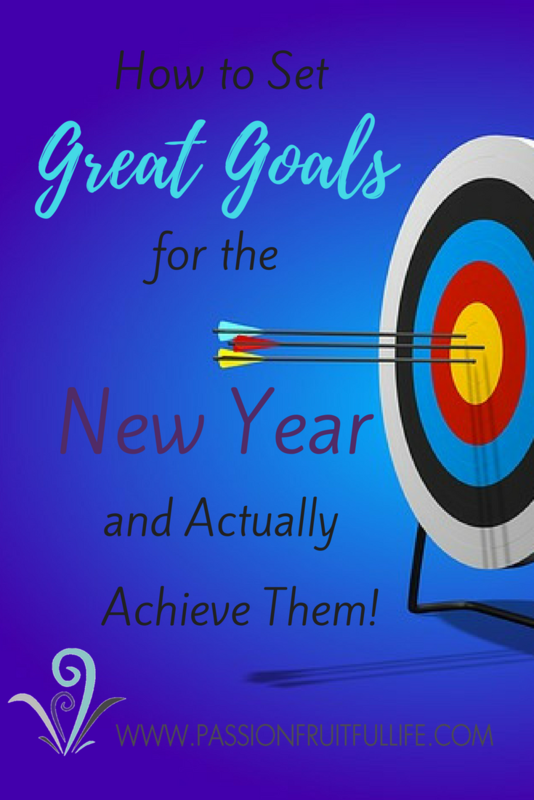 Last year I tried to follow many of the principles I learned from Michael Hyatt in his webinar about setting goals for the new year. I set goals in 10 areas and they are posted up on my wall last January. Although I do have some work in some of them yet, I do feel like I made a lot of progress in pretty much all of them–and that feels wonderful! and take a class in group coaching. Again, I still have lots of work in some of the goals–for example, I still have a hard time getting my house consistently clean and tidy (but that basement is staying organized–yay! ), and though my relationship with my husband is good (and even great at times), I know it can be awesome, and I want to keep exploring what I (and we, if he’s willing) can do to make it that way. But even in these goals I’ve definitely made measurable progress this past year–and that’s more than I can say for many other years in the past. Here are some of the principles that have been working for me and I know they can help you, too! Pray through the process of coming up with your goals, and pray as well all throughout the year for help. Prayer is # 1 on the list. Without Jesus’ help, we really can do nothing of significance! (John 15:5) Sometimes in difficult times it may be hard to believe that God wants the best for us, but it’s true. He’s on our side, and he wants to give us life to the full (John 10:10). We need to turn to Him, our wise Counselor and Helper. Take time to (prayerful) plan. It’s such a good idea to take a significant amount of quiet time to really pray, hope and dream for the next year. Don’t treat this as a casual thing to do New Years’ Day as you make spur of the moment goals. Sit down and really think about the areas of your life you want to improve. Ask God to give you His desires for the year–you’ll find that His desires are the very ones that will make you feel most fulfilled and joyful, as well. If you don’t have a day or two to block off for dreaming and goal-setting, just book some hours here and there. I suggest starting a month or so before January, but you can do this in January, too, if that works better. Ponder different areas of your life. Not all of the following areas may apply to you–and you may want to add some others– but here are some examples: spiritual life; social life/friendships; career fulfillment; ministry effectiveness; marriage relationship (if married); relationship with each of your kids (if a parent); recreation/relaxation; etc. Think and pray about what each of these areas could look like and write that down. Then write about where you think you are now. Write your goals for the year down and then focus on a few at a time. You don’t have to tackle the areas/goals all at once–often it’s said that it’s best to aim for progress in 3 goals each season of the year. But for now, think about the entire year and which areas you’d like to improve. Michael Hyatt recommends writing down 7 – 10 goals for the year and then choosing a few to focus on each quarter of the year. He says that writing down your goals and posting them somewhere where you can regularly see and review them, will make you much more likely to accomplish them. To form your goals, check out #5 below. Flesh out your goals by making them SMART. S–Specific: this means that you get down to the details of what your goals means–what, where, when, how, etc. Getting out of vague-land and knowing the specifics can help you understand what your next steps will be and make it easier to complete them. M-Measurable: this means that you think about how to measure your progress. So instead of saying “I want to eat more veggies”, you would say “I want to eat 3 -4 portions of veggies every day”. This could be put on a tracking chart so you can easily see how you are dong. A–Attainable: “attainable” and “realistic” are really similar things, I think. These words simply mean that this is a good goal for you. It’s not to big and you can do it. One of the biggest ways to not succeed at your goals is to set goals that are way to large for you. That’s unfair to yourself, and will just cause you to give up. Much better to set baby steps–really small goals–on your way to your bigger goals, and then you can have the thrill of a little success which will motivate you towards more. T–Timed: When do you want to start working on this goal? When do you want to complete it? When do you want to start seeing progress? Have a time-line and gently due-dates can really help with motivation, especially when combined with the tip (#6) below. This is so huge and I think accountability is one of the most important things to have in place to help us actually achieve our goals. That’s why people join weight loss groups, find accountability partners, etc. Sharing your goals with someone can feel like unnecessary extra effort, but knowing that you will need to report to your group (or kind-hearted friend) motivates you like almost nothing else will. One caveat–it’s very important to find an accountability partner or group that will truly help you reach your goals. Again, according to Michael, telling all kinds of people your goals can actually demotivate you from completing them if they aren’t going to encourage you and check in on you. So WHO you choose is of utmost importance. Okay, so as a life coach of course I’d love to help you set and achieve your goals and be that encouraging accountability partner you need. That’s one of my favourite things to do! I’m certified as a professional life coach by the Christian Coach Institute, and therefore I’ve been trained in helping people set good goals and then achieve them. Don’t worry–I don’t expect perfection. I know life can be difficult and I know well from experience that it’s not usually easy to meet your goals. But having a life coach at your side can truly make an amazing difference as I help you set good goals and encourage and pray for you as you go! This December 2017 and January 2018, I’m offering all my life coaching packages (except e-mail coaching) for 1/2 off! think about what you need to have in place in order to better reach your goals–accountability with others, posting them up in a place you’ll see them regularly, working on a few at a time, etc. Then, in the rest of your sessions, we’ll see how things are going, and I’ll help you adjust your goals and access resources you need to continue on your way! Also, if you are able to find a friend who is also interested and buys a package, you’ll get 20% off the price of your package! Contact me for a free 20 minute (or so) Discovery Session where you can ask questions and learn more about coaching, and I can learn about what areas of your life you’d like to improve. From there you can decide if life coaching with me sounds good to you –no obligations to continue. I’d love to hear from you and help get you started on a great 2018!